Mike Views Rare Pre-Release version of RAM Rebel in San Diego. His review on Tonight's Show. 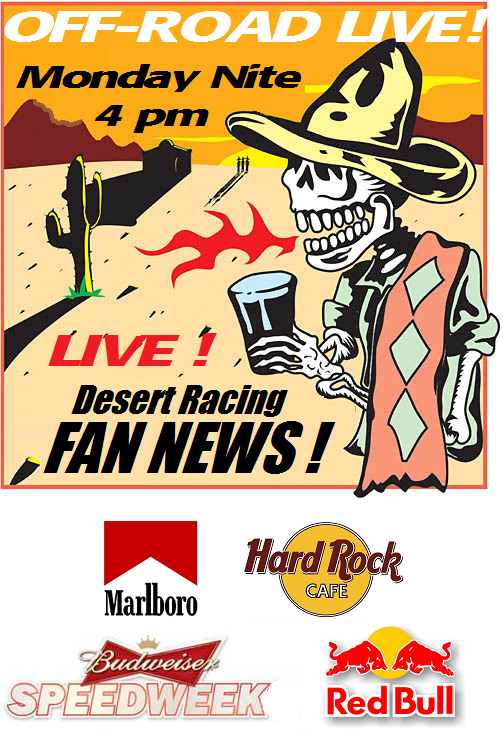 Mike delivers the EXCLUSIVE Insider View of the newest OFFICIAL OFF-ROAD LIVE! 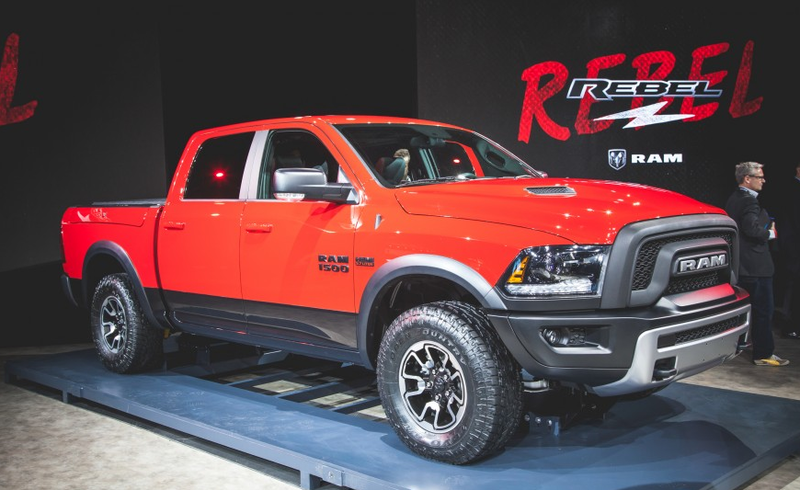 Truck: The 2015 Ram 1500 Rebel! 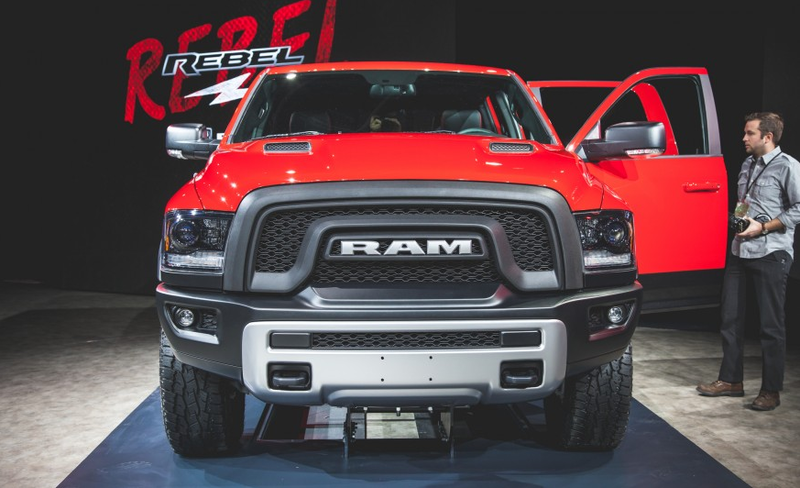 The dramatic, unique exterior styling immediately shows that the Ram Rebel offers something different. “It’s a truck built and styled for people who push back, whenever they hear those despised words: you can’t,” said Mike. For added strength, sport-performance, and traction, the Ram 1500 Rebel rides on 33-inch Toyo All-Terrain tires. The Ram-stamped tailgate and blacked-out badging let others know who the leader is on the road. “With its distinctive good looks, high-value contenting and true full-size truck capability…it’s the perfect vehicle for people who always push the limits, and push themselves to squeeze more enjoyment out of life”. RAM Trucks listen to what truck owners want, and then Ram Trucks put everything they have into delivering it, always pushing what’s possible. The Off-Road community couldn’t be more excited to get "The" Truck so you can take living the “Ram Life” to a whole new, rebellious level. 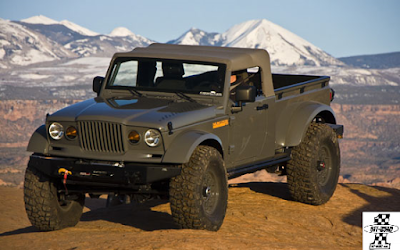 Chrysler Group LLC arrived with truckloads of head-turning, "Moparized" Jeep® and Ram Truck vehicles to showcase at the 44th annual Moab Easter Jeep Safari in Moab, Utah. "Our customized production vehicles show how Mopar can accessorize Jeep and Ram vehicles that are on the road today while our image vehicles showcase directions we could take in the future," said Pietro Gorlier, President and Chief Executive Officer – Mopar Service, Parts and Customer Care, Chrysler Group LLC. "We will gauge reaction to these vehicles. And as we develop our next generation of new Mopar parts and accessories, we will listen closely to this dedicated group of hard-core off-road enthusiasts." The Mopar design team is a small group of dedicated engineers, designers and fabricators who are led by Mark Allen, Chief Designer – Head of Jeep Design Studio, Chrysler Group LLC. 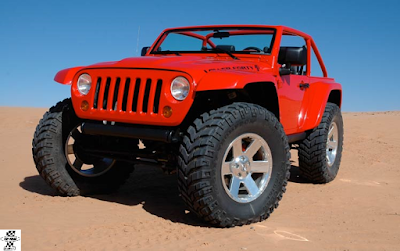 The Mopar design team has been customizing production vehicles since 2002 and has introduced nearly 20 concept vehicles to enthusiast crowds at the Moab Jeep Safari. 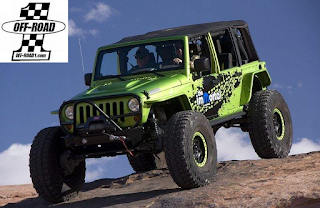 The Mopar off-road engineering team is led by Keith Montone, Manager – Mopar Jeep and Ram Off-road Engineering, Chrysler Group LLC. This experienced group of vehicle engineers is dedicated to providing Jeep and Ram customers with the best off-road parts and accessories. The team has introduced many new parts and played a key role in developing the first aftermarket lift kits available from an automotive manufacturer. "Moab is a proving ground for us to test our vehicles on extreme trails alongside our customers," said Allen. "We will take all of the feedback we get from our customers right back to the design studio with us." 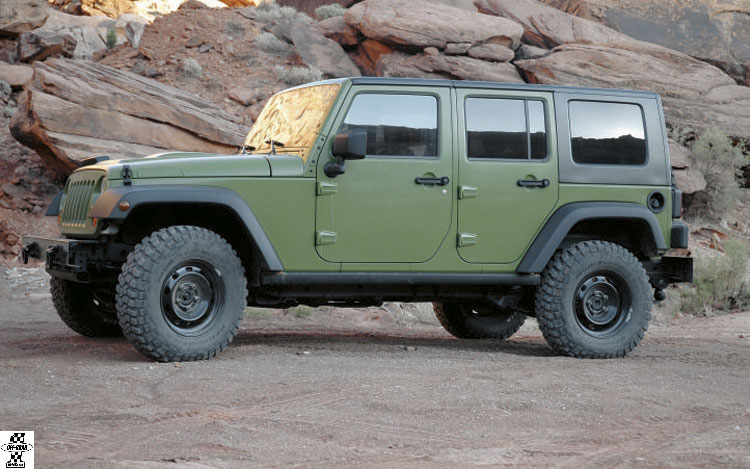 Built off of a four-door Jeep Wrangler Rubicon, the Jeep Wrangler J7 is designed to have the basic appeal of military-issued vehicles. The Mopar team removed standard content including carpet, fog lamps, alloy wheels and the stereo system before adding front and rear steel bumpers, 'helicopter hooks', a heavy-duty tailgate and steel wheels. Off-road capability is increased with a Mopar 2-inch suspension lift and 35-inch Mickey Thompson tires. The unique Mustard Plug exterior paint is highlighted with Jeep Wrangler J7 graphics. The Mopar team started with a Sunburst Orange Jeep Patriot model equipped with the Trail-Rated off-road package and added a 2-inch Rocky Road Outfitters suspension lift, TJ 'Moab' 16-inch wheels, and BF Goodrich KM2 tires. Additional protection is added to the front and rear fascias with custom rock rails. Mopar added heavy-duty slush mats, Kicker audio and a roof-mounted snowboard carrier. kit, slush mats and a Kicker audio system. wheelbase is stretched to 124 inches from 116 inches. Enforcing the brand's iconic M-715 is a new front clip produced in carbon fiber that re-creates the characteristic forward slant of the M-715 truck. To top it off, Bestop provided a unique soft top which artfully captures all of the quirks of the original. Drivetrain upgrades include beefy Dynatrac Pro-Rock Dana 44 front and Dana 60 rear axles filled with 5:38 gears and ARB Airlocker differentials. Power is distributed by an Atlas II transfer case spinning custom driveshafts from Tom Woods. To keep the military look, tires are 38-inch BF Goodrich Mud Terrains mounted on Hutchinson beadlock wheels. The powerplant remains a J8-specific 2.8-liter turbo diesel I-4 that has been treated to a re-programmed controller for more boost. Fuel is supplied from a custom Gen-Right tank made specifically for this vehicle and mounts to the rear cross member. spare tire is re-located to the cargo box. For visual impact, the team used a menacing two-tone black-on-white look, inspired by the wild paint schemes of Power Wagons in the 1970s. performance lift kit installed on a 2009 Jeep Wrangler. A new flat fender kit and Mopar/Hutchinson Rock Monster beadlocks allow tire pressure to be safely lowered for extreme driving conditions. Front and rear off-road bumpers and rock rails offer serious protection while the Mopar half-door kit provides improved visibility. The hood and rear spare tire carrier feature custom Mopar graphics splashed across the Mopar Blue exterior. This is a new kind of Ram. Inspired by Baja-style desert racing, this 4×4 is unlike any other in captivity. 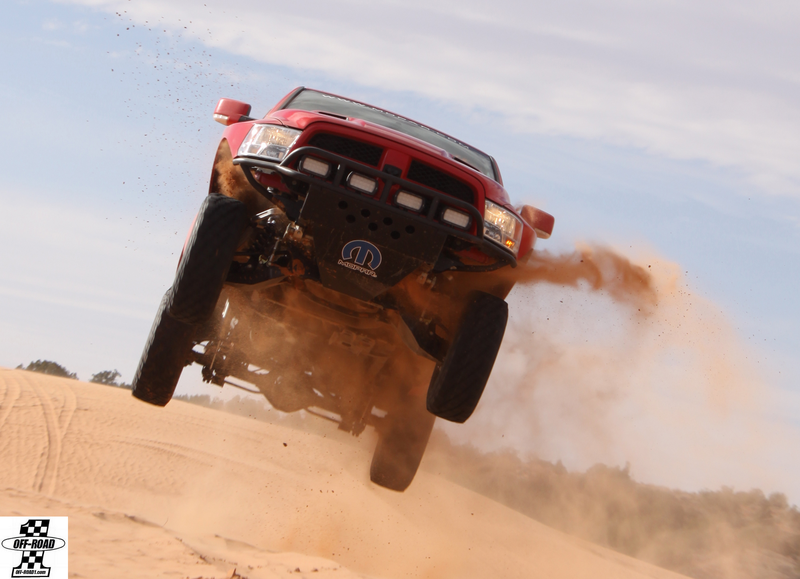 The rigors of off-road racing require large tires, plenty of ground clearance, extreme durability and a sophisticated suspension system capable of withstanding tremendous impact. These features are combined into a package that is stable at speed and rock-solid in the corners. To achieve this kind of handling, a low center of gravity and long wheel travel are paramount. 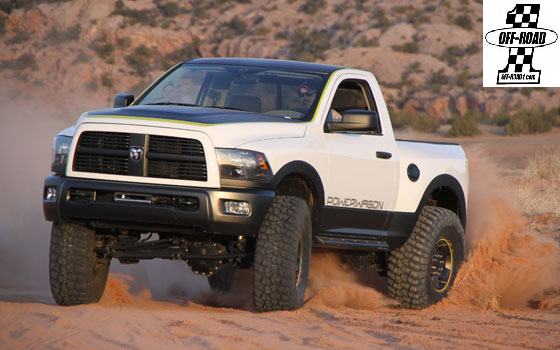 The Mopar Ram Runner has the look and feel of thoroughbred desert racer. Inspired by trophy trucks, steel front fenders and rear bed-sides are replaced with fiberglass, allowing tremendous suspension articulation with zero interference. 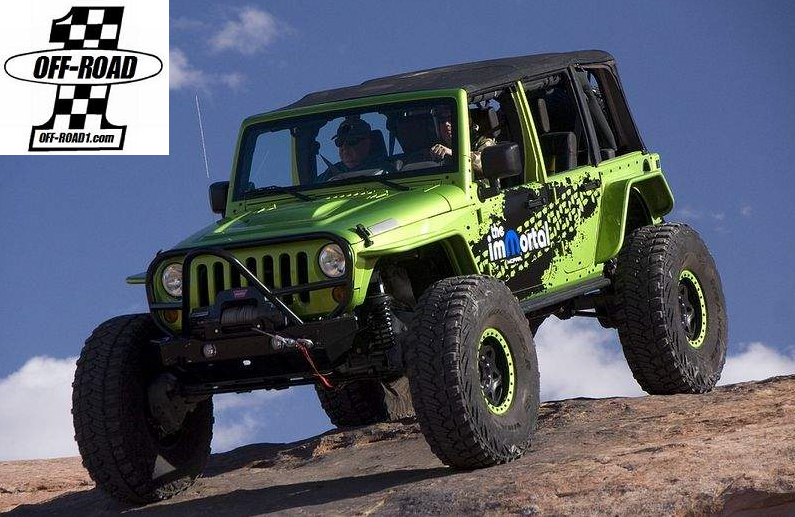 The Mopar ImMortal is a Jeep Wrangler featuring portal axles, a 5.7-liter HEMI and off-road bumpers. Military-grade portal axle ends are engineered to mate to Mopar's Pro Rock and Power Wagon performance axles and adapted to fit the suspension. Portal axle ends provide 5 inches of lift and contain a 1.5 gear reduction. 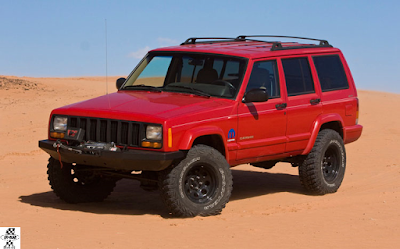 Combined with the 4:1 transfer case, the result is a hard-core 100:1 crawl ratio. The Mopar ImMortal is sheathed in Jeep performance body armor for intense protection. Mopar distributes approximately 280,000 parts and accessories in more than 90 countries and is the source for all original-equipment parts for Chrysler, Jeep, Dodge and Ram vehicles. 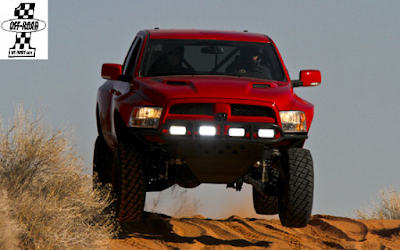 Mopar parts are unique in that they are engineered with the same teams that create factory-authorized vehicle specifications for Chrysler, Jeep, Dodge and Ram vehicles – a direct connection that no other aftermarket parts company can provide. A complete list of Chrysler, Jeep, Dodge and Ram vehicles is available at www.mopar.com. When Chrysler bought Dodge in 1928, the need for a dedicated parts maker, supplier and distribution system to support the growing enterprise led to the formation of the Chrysler Motor Parts Corporation (CMPC) in 1929. Mopar (a simple contraction of the words MOtor and PARts) was trademarked for a line of antifreeze products in 1937. It also was widely used as a moniker for the CMPC. The Mopar brand made its mark in the 1960's – the muscle-car era. The former Chrysler Corporation built race-ready Dodge and Plymouth "package cars" equipped with special high-performance parts. Mopar carried a line of "special parts" for super-stock drag racers and developed its racing parts division, called Mopar Performance Parts, in order to enhance speed and handling for vehicles both on the road or at the track.